There are things I’ve meant to comment on here recently, but which haven’t fit in with the longer reviews I’ve been writing – so here are some random observations and miscellaneous thoughts. First, I’ve failed to note several sad deaths, beginning with Peter Sallis, who died on June 2 at the age of 96 after a seven-decade career as a character actor in everything from the long-running television series Last of the Summer Wine to Gordon Hessler’s Scream and Scream Again, with more than 150 credits in television and features. But for me, Sallis will always, and indelibly, be the cheese-loving, somewhat clueless inventor in Nick Park’s wonderful series of claymation films about Wallace and his much smarter dog Grommit. On June 14, model and actress Anita Pallenberg died at 75. Best known for her involvement with Mick Jagger and Keith Richards, she appeared in a number of edgy films which pushed the limits of the mainstream. She was the evil queen in Roger Vadim’s Barbarella, had a small role in Christian Marquand’s Candy, co-starred in Marco Ferreri’s Dillinger is Dead, and played one of Turner’s lovers in Donald Cammell and Nicolas Roeg’s Performance. On June 16, it was director John G. Avildsen, who was 81. Avildsen was a competent rather than inspired filmmaker who made a number of very popular movies during a fifty-year career which included Rocky, for which he won numerous best director awards, including an Oscar. Another hit was The Karate Kid, a similar tale of an underdog’s triumph. He guided Jack Lemmon to his second Oscar for his lead role as a morally compromised businessman in Save the Tiger. He also launched Peter Boyle’s career with the sour, reactionary Joe in which a hateful bigot goes hunting for hippies. By a strange coincidence, news of Adam West’s death on June 9 came the day after I’d re-watched Byron Haskin’s Robinson Crusoe on Mars in which he had a brief supporting part just two years before landing the role which defined him, despite the fact that he had almost 200 credits over six decades. In 1966 he became Batman in the campy TV series which lasted three seasons. Strangely, what made that show a success was the impression that West gave of not being in on the joke. He played the Caped Crusader with a straight face and what seemed like complete sincerity, an attitude which just made the show seem even funnier. I’ve neglected a number of disks which deserve more attention, but I’ll just mention them here with perhaps longer reviews at a later date. Although I found Night Shift (1982) and Splash (1984) fairly entertaining, for years I didn’t have much of an opinion of Ron Howard as a filmmaker. His work seemed to consist mostly of mainstream mediocrity – Far and Away, Willow, Backdraft, A Beautiful Mind, Cinderella Man, Ransom, The Missing and so on … But then a few years ago a friend kept insisting that I should watch Frost/Nixon (2008). I wasn’t that interested; after all, the story was extremely familiar from all the coverage it had received at the time and I couldn’t imagine what a docudrama by Howard could add to it. But I finally did watch it, and it was a riveting character study. As a fan of conspiracy thrillers, I decided to try The DaVinci Code (2006), but it was a tedious bore. 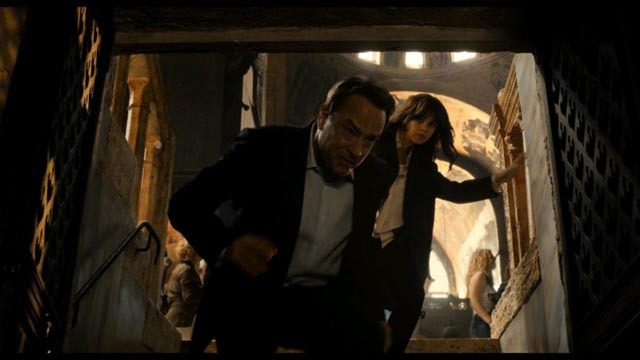 However, the sequel, Angels and Demons (2009), turned out to be a rousing, fast-paced entertainment which – rather than ponderously taking itself seriously like its predecessor – reveled in the absurdity of its plot. Then came Rush (2013); although I have no particular interest in Formula One racing, this turned out to be another intense character study, made with a strong visual style. So, despite my misgivings about so many of his movies, I’ve recently found myself re-evaluating Howard to a degree. Which is why, although again I hadn’t much liked Apollo 13 when I saw it in a theatre in 1995, I picked up a copy of the Blu-ray on sale. This is a movie another friend regards very highly because of its attention to the technical details of space flight and the solving of problems under pressure. And watching it again, I had to agree; where before I had seen it as wallowing in patriotic sentiment, it’s actually a very restrained treatment of the near-disaster which almost killed three astronauts. I first saw Mel Gibson in George Miller’s Mad Max (1979) and became a fan. He had genuine screen presence, a mixture of charm and barely suppressed menace. For most of the following decade, he appeared in a lot of Australian movies (or U.S./Australia co-productions) which consolidated his screen persona as a kind of romantic action star – the rest of the Mad Max trilogy, Peter Weir’s Gallipoli (1981) and The Year of Living Dangerously (1982), Roger Donaldson’s The Bounty and Gillian Armstrong’s Mrs. Soffel (both 1984) – but in 1987 he was almost instantaneously transformed when he starred in Richard Donner’s Lethal Weapon. He became more one-dimensional as a representative of over-the-top comic violence. The dangerous edge which had always been there took precedence, but now as a joke. This coincided with his move from Australian star to Hollywood player. While Miller had brought out the larger-than-life mythic element of Gibson’s screen persona and Weir had focused on the ways in which that persona could be contained in a more realistic, naturalistic context, Donner and Hollywood pushed him towards something closer to a caricature. And that caricature became a huge international success, appearing in a long string of action-comedies and thrillers. But something else was happening at the same time, perhaps tied to what gradually emerged about Gibson’s regressive religious beliefs. Channeled by Hollywood into often mindless entertainments, Gibson craved seriousness. He acquitted himself quite well in Franco Zeffirelli’s Hamlet (1990), but it was with his directorial debut in 1993 that something essential about him became apparent. The Man Without a Face reveals an almost fetishistic attraction to bodily mortification, which in retrospect reflects all the way back to the physical batterings he suffered as Max Rockatansky. He reveled in torture in his next directorial outing, Braveheart (1995), and it was the essence and purpose of his notorious follow-up, The Passion of the Christ (2004), which is a lovingly detailed two-plus hour depiction of the destruction of a single human body. Here we see that Gibson’s religious obsessions seem to have little to do with the spirit and everything to do with a fascinated horror of the physical. This entry was posted in Commentary, Obituary, Review and tagged Directors, Docu-drama, Horror, Jean Rollin, Mel Gibson, Obituary, Ron Howard, Thrillers, War Films, Wes Craven, Western. Bookmark the permalink.